"I love all sorts of collections of aphorisms as you can tell from the following selection. This one is beautiful and haunting. Lots of nuggets to open vistas." The elusive French luminary Joseph Joubert is a great explorer of the mind's open spaces. 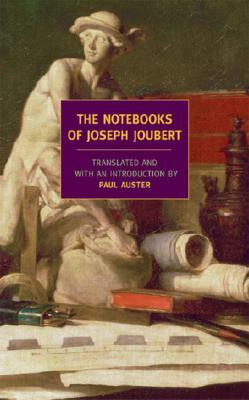 Edited and translated by Paul Auster, this selection from Joubert's notebooks introduces a master of the enigmatic who seeks "to call everything by its true name" while asking us to "remember everything is double." "Joubert speaks in whispers," Auster writes. "One must draw very close to hear what he is saying." Joseph Joubert (1754-1824) was a philosopher who associated with the leading French thinkers of his day. He published little during his lifetime, preferring to record his thoughts in his voluminous notebooks. After Joubert’s death, his friend, Chateaubriand, distributed these writings, which won Joubert posthumous fame and influence. Paul Auster is the author of ten novels, most recently The Book of Illusions. He lives with his wife and daughter in Brooklyn, NY. "Neither a poet nor a novelist, neither a philosopher nor an essayist, Joubert was a man of letters without portfolio whose work consists of a vast series of notebooks in which he wrote down his thoughts every day for more than forty years. All the entries are dated, but the notebooks cannot be construed as a traditional diary, since there are scarcely any personal remarks in it. Nor was Joubert a writer of maxims in the classical French manner. He was something far more oblique and challenging, a writer who spent his whole life preparing himself for a work that never came to be written, a writer of the highest rank who paradoxically never produced a book." "[H]e was one of the first completely modern writers, preferring the center to the sphere, sacrificing results to the discovery of other conditions, and writing not in order to add one book to another but to take command of the point from which it seemed to him all books issued…"